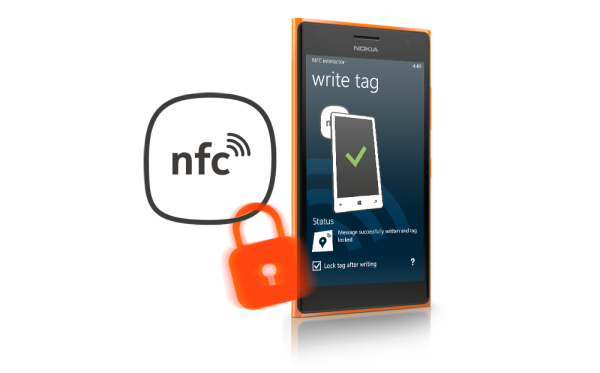 The latest update of NFC interactor adds one of the most vital functions for real-life NFC tag usage: write-protecting tags. The app now allows locking a tag so that its contents can never be changed again – which is what you want when you stick a tag in the public, to prevent others from overwriting or modifying your contents. NFC interactor is the first app to implement this functionality on Windows Phone. This is made possible through the new NFC hardware found in the latest Lumia devices. Therefore, locking tags is only available on the Lumia 730 / 735 / 830 at the moment. All future Windows Phone devices with NFC support are expected to support this new feature as well. When starting the new NFC interactor version for the first time, the app checks if your phone supports locking tags, and (de)activates the app feature accordingly. If your phone does allow locking tags, you can also go to the settings page and define that all tags you write get locked by default – another great time saver if you’re dealing with large amounts of tags. Note that locking tags is a one-way process: once the tag is write-protected, you can never change the contents again. Be careful and test your messages before locking tags! When you create a 3rd Party LaunchApp-tag that causes the phone to immediately start any app, NFC interactor supports you by offering a convenient store search feature. Simply enter the app name / a search term, then choose the exact app to launch from the list. NFC interactor takes care of finding out the ID. NFC interactor 8 greatly improves the App Store search functionality – instead of searching the hardware-independent US store, it now integrates your country, language, device, manufacturer and operating system version in the search. This will make it easier to find the relevant apps you’re searching for, and enables finding most manufacturer-exclusive apps (e.g., Lumia Camera, Cinematograph, etc). In addition, NFC interactor now allows launching the “project my screen” app – a new feature of the latest Windows Phone 8.1 updates, allowing to use a Miracast-Receiver to project your phone screen on a TV. The new update of NFC interactor 8 is already available for download, and a free update to everyone who has purchased a previous version.